Making its maiden voyage in 1998, the Jean Nicoli has been an integral part of the Corsica Linea fleet. 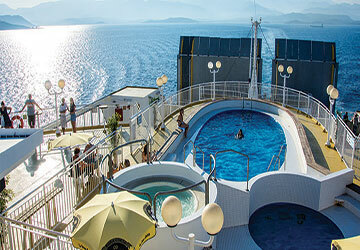 With a number of restaurants, luxurious cabins, modern décor and even a top deck swimming pool, it’s no surprise this ship is still delivering thousands of happy customers each week. 1052 passengers and 600 vehicles can travel aboard at any given time, at speeds of up to 27 knots. The ship is catered for young and old to travel aboard, with a dedicated a children’s area to keep the little ones occupied. There is also room for your four legged companions with the ferry’s kennel area. 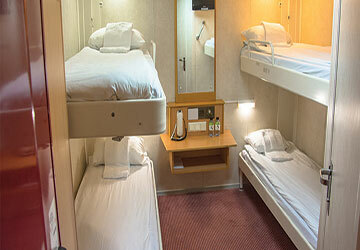 With the option of both two and four berth cabin accommodation, it’s easy to relax and enjoy your Corsica Linea sailing. A number of rooms come with washroom facilities but don’t worry the one you’ve booked doesn’t, as there are showers on offer to all passengers. If you haven’t booked a room that doesn’t mean you can’t travel in comfort. 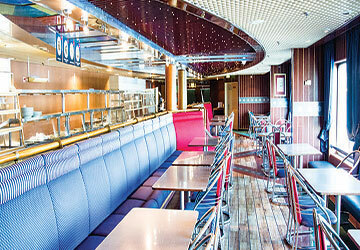 A large amount of table seating is located throughout the ship with a large number of airline style lounge seats also present, ensuring the ultimate comfort whilst travelling to your destination. The on board culinary options provide a wide array of dishes, from local Corsican specialties to different flavours from around the world. These come at a range of prices, adapted to suit not only varying tastes but differing pockets too. As well as main meals, sandwiches and salads are freshly prepared and you’ll also find a great selection of desserts and cold drinks at the different food outlets. There are extensive menus for the restaurant, self service area, the snack bar and a huge variety of soft and alcoholic drinks at the bar. Shopping is available on board the ferry and it’s the perfect place to pick up some souvenirs or gifts. The choice of local products provide the ideal present for family and friends. If the extensive range of drinks wasn’t refreshing enough for you, you can cool off even more with the top deck swimming pool. 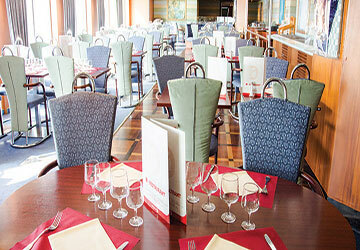 Here you can admire the crystalline sea views and take in the warm and sunny climate whilst you travel. You can also chill in the whirlpool, if that takes your fancy. There’s plenty of room around the pool and outdoor deck area for those who don’t want to take a swim to take in the sunny vistas, maybe even with a drink in hand. Wi-fi is available for customers, with both hour and two hour packages available. 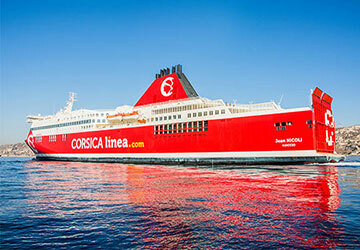 Corsica Linea offers a dedicated space for children on all of its vessels. Special games are available as well as movies and cartoons, all of which are free in these devoted kids areas. Baby bottle warming facilities, changing tables and specialised children’s bathrooms are available so you don’t get caught out with the little ones aboard. Disabled access toilets are available for those who travel with restricted mobility. Please Note: Whilst we have taken great care in making our Jean Nicoli guide as accurate as possible, onboard facilities, services and entertainment may vary depending on the date and time of year that you travel, facilities mentioned may change without notification and ferry companies reserve the right to operate vessels other than those mentioned at time of booking without prior notification.